Accentuated by eight different shades of brilliant-cut orange sapphires, from pale to dark, the famous octagonal Royal Oak bezel is contrasted not just by its 40 gems (.96 carats) but also by its eight hexagonal screws which are in white gold. 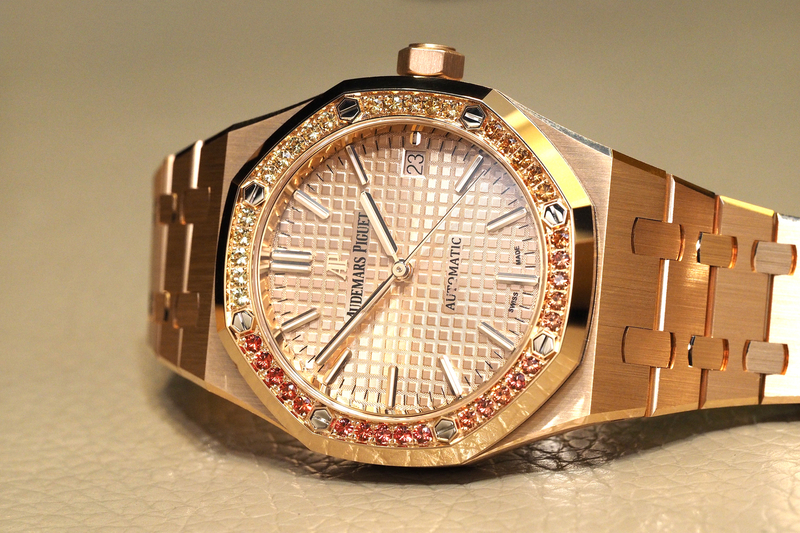 The 18K pink gold case measures 37 mm in diameter x 9.8 mm in thickness. Every surface of the case and pink gold bracelet is expertly polished or satin brushed for a subtle yet luxurious appearance. Although the gems and case are nice on the eyes, its the beautiful pink gold-toned dial – with “Grande Tapisserie” pattern, pink gold applied hour-markers, and Royal Oak hands – that really caught my eye. Even the date wheel, visible through an aperture at 3 o’clock, is pink gold toned. Underneath the dial of this feminine Royal Oak is the same motor seen in the rest of the three-hand Royal Oak Self-Winding collection, caliber 3120. Beating at a rate of 3Hz, the movement is automatically wound in either direction by an engraved 22K pink gold oscillating weight, with a power reserve of 60-hours. The bridges are beveled and polished and feature Geneva stripes, along with circular graining on the mainplate.